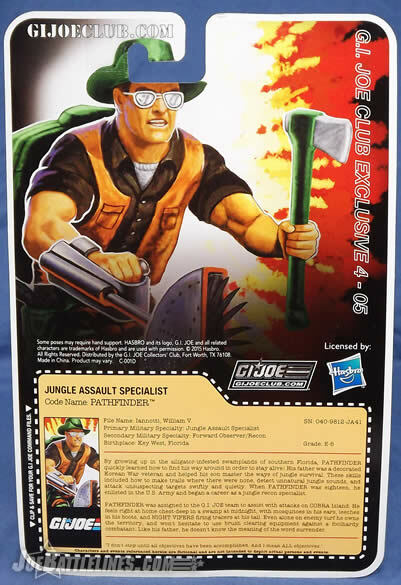 Here’s where folks can say that I’m not a fan, but Pathfinder wasn’t a blip on my Joe fan radar until I got back into collecting in 1998. Much like you, I was in high school when he debuted and, as a junior at the time, purchasing G.I. 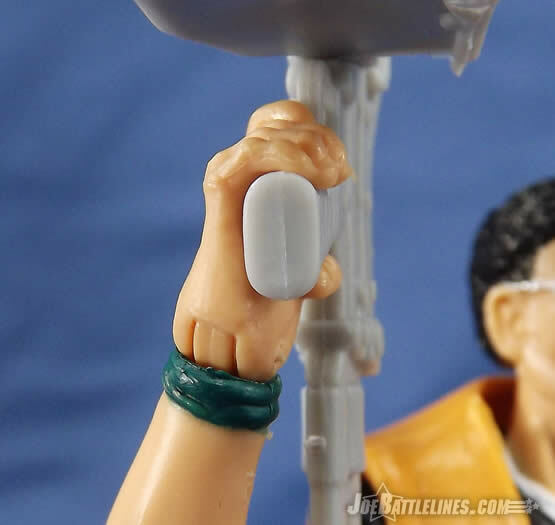 Joe figures just wasn’t on my radar. In fact, I think my first Pathfinder figure was the gray 2001 version, but that’s a story for another day. 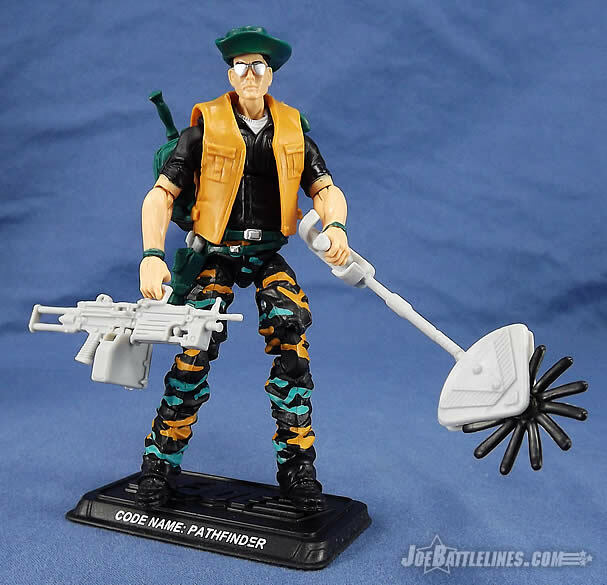 I do have to admit that I was pretty excited to see him announced as part of FSS 4 simply because he was one of those characters that I discovered as an adult collector. There was no pull of childhood nostalgia associated with him—I just like his overall design and wanted to add him to the modern construction collection! Nothing special for me either, but I did do a custom of him I entered at a prior JoeCon custom contest. The parts… Fred, Scott, buff up! I feel a Wall of Text +3 with a DR 10 coming in! Pathfinder (no pun intended) uses a relatively decent body build to make him a bit taller and bigger than most figures, and it’s fairly faithful---until we get to the head: it’s way too small. ‘Small’ as in a human being would not be alive without significant complications in cognitive and physical problems, small. Look at it compared to Jammer’s head! Pathfinder’s is almost half the mass! When the head was used on Lifeline it was noticeable but his helmet added some bulk making it passable. Not so here. Add in the problematic vest (which we’ll discuss below), and you have a potentially perfect figure utterly ruined by inept part choices because the Club got lazy. Instead of trying to hold true to the characters, the Club tried to hold true to their accessories. This is clearly demonstrated by money being spent on Barricade’s missile launcher, Pathfinder’s weed trimmer, Sneak Peak’s periscope, and Bullhorn’s bullhorn rather than new heads that would make each character singular. For as much as the Club claims they try to do things “vintage accurate”, they certainly don’t care about how accurate the portraits are. 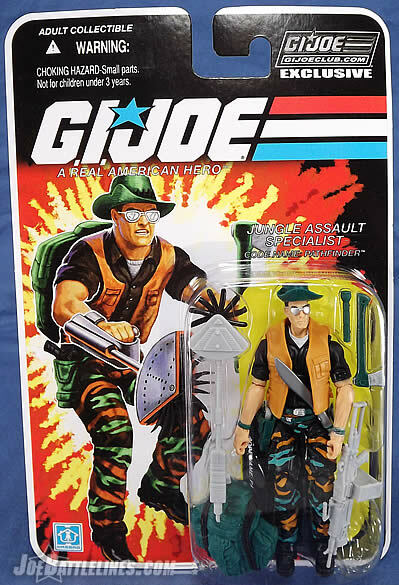 This was a mistake because most people’s favorite characters aren’t based on the spring launched missile they had in neon yellow, but the character personified in their own unique likeness. I mean really, does no one at Club have any eye for proportion or scale? This would have been fine for a fan-made custom. (In fact, most customs used this exact build long before the Club did.) 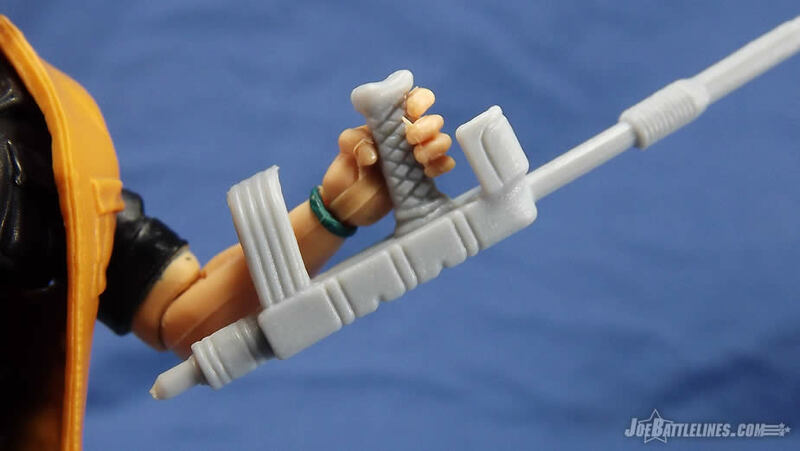 But this is not acceptable when it isn’t any better than a fan custom, and especially not when it’s sold as premium adult collector figure with a hefty price tag. I agree, Chris. He should have come with a newly tooled head. 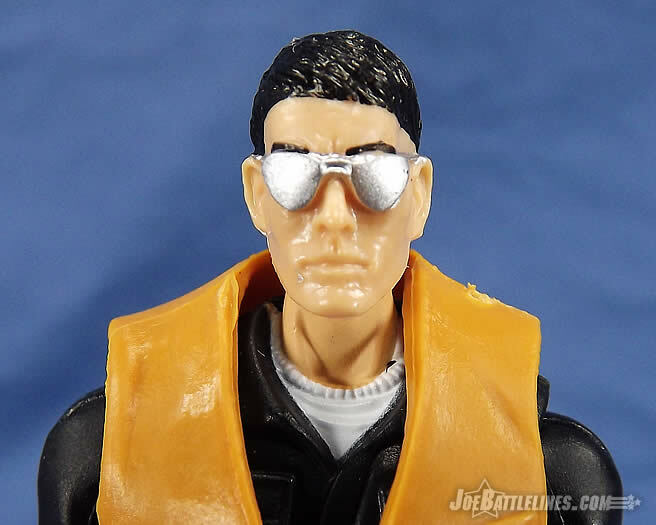 V-1 Pathfinder also had a more round and fuller face than the Lifeline face, so the only thing that really matches is the sunglasses and they are the wrong color. They should be light green. As far as I’m concerned the way he comes his head is just too small. I am surprised at how few new heads we are getting in this set! Honestly, I don’t have QUITE as much of a problem with the head as Chris or Scott do. Granted, it does look tiny, especially when compared to his shipment-mate Jammer’s giant noggin’. Maybe it’s the fact that I’m trying to keep this review brief after Chris’ diatribe [thoughtful articulation of constructive criticism] but something about this body just doesn’t work. It’s missing that one element, much like The Dude’s rug, that just “brings the room together.” He looks good but not great and after some of the past Club figures he just falls into the middle of the road for me. If the head ruins the body, at least the colors do not. The deco is very well done and it is near-perfect to the original. As both decos showcase, the beauty lies in the simplicity of staggered aqua-teal and brown against a black backdrop. Like with Jammer, this is another tiger stripe pattern that would have run circles around the camo patterns in last year’s Tiger Farce set. If there’s one thing that you can’t fault the Club on, it is their near fanatical devotion to replicating vintage designs. (Often at the expense of functionality but that’s another story entirely.) 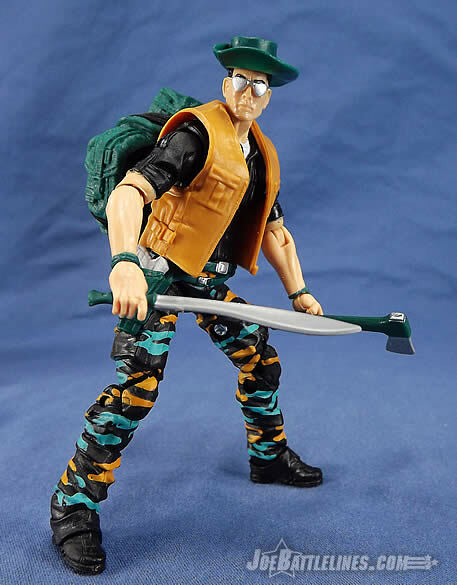 Pathfinder’s design is pretty much a spot-on recreation of the original 1990 figure’s color scheme—right down to the bizarre camouflage pattern. I’ll give kudos where kudos are due—the Club nailed this part darn near perfectly. Yes, those colors are spot on. As stated above, Pathfinder comes with a problematic vest (courtesy of RoC Heavy Duty and Club indolence) that is not at all fitted to his build. The consequence is something that is too big, too wide, and too high. Instead of sitting at the shoulders and draping down, the vest is lifted up at the neck and above the shoulders---the exact opposite as how it should lie. This makes Pathfinder look wider in the middle and it gives the illusion that his neck is very short and recessed into the torso. This in turn further accentuates how dinky the head is, and it makes it look that much tinier. Even the photoshopped pics showed this glaringly obvious flaw, yet it was ignored in typical Club fashion. Sorry folks—Chris took point on this one so we’re in for another head-size rant. You might want to come back in a few minutes when he’s got this out of his system. To prevent this review from during into a 10,000 word treatise on figure design in the 21st century, I’ll just pass the keyboard back and chime back in when he’s run out of steam. Out of steam? My dear Mr. Meyer, my power source is a fully charged Zero Point Module. I don’t run out of steam! We then come ahead (pun intended) to another head issue, this time the hat. Again, corners were cut. No newly tooled hat for us, instead we got stuck with the 30th Gnawgahyde’s slouch hat. (Off topic for a second, but that’s a hard word to spell correctly. Whoever named him that needs to be flogged, then tar and feathered!) 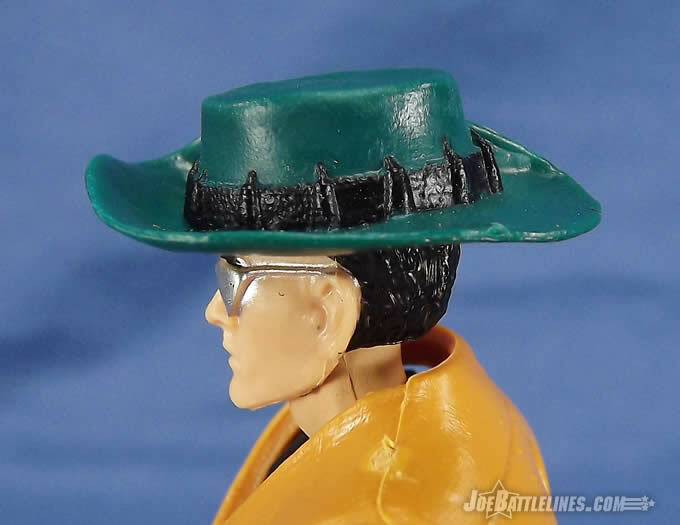 Moving on, as with most modern figures, the hat doesn’t stay on very well---mainly because it wasn’t designed to use that head as an underpin. The result is something sort’a like Pathfinder’s vintage hat, but more sort’a not. A new head/hat combo should have been made. 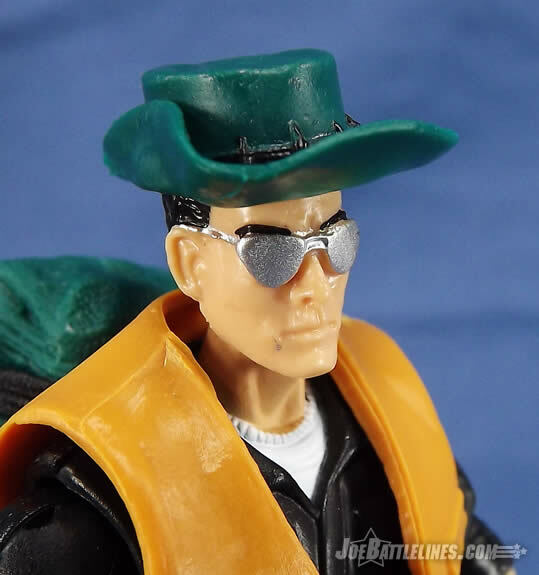 I wouldn’t have even minded if the hat wasn’t removable as long as it and the head looked good, but in the current case you’ll have to glue it on if you don’t want it constantly falling off. The Club should have sculpted a new hat. And a new hat that was the same style. 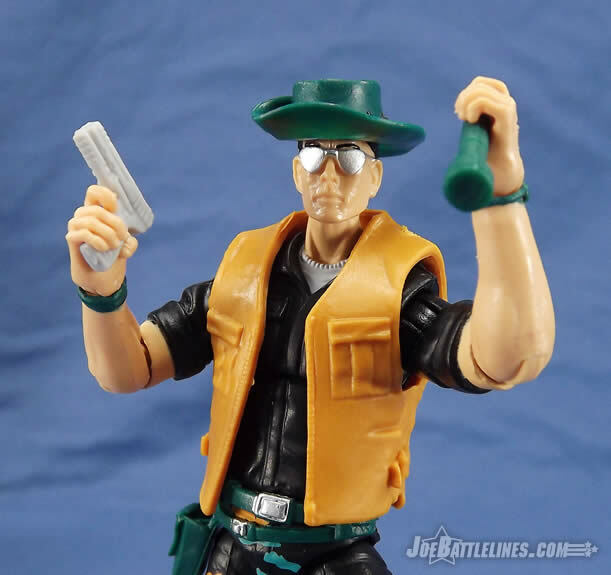 I would not have minded either if the hat was attached to the head like the original figure had on it, but it is not the same type and is too big, plus his vest is WAY too big. I think they should have used the Sgt. Stone vest instead. It wouldn’t have been as accurate, but it would have been a much better fit. I have to put in a disclaimer here—as the guy who takes all of the pictures the readers are stuck looking at my Pathfinder figure whose hat was pretty badly warped in the package. 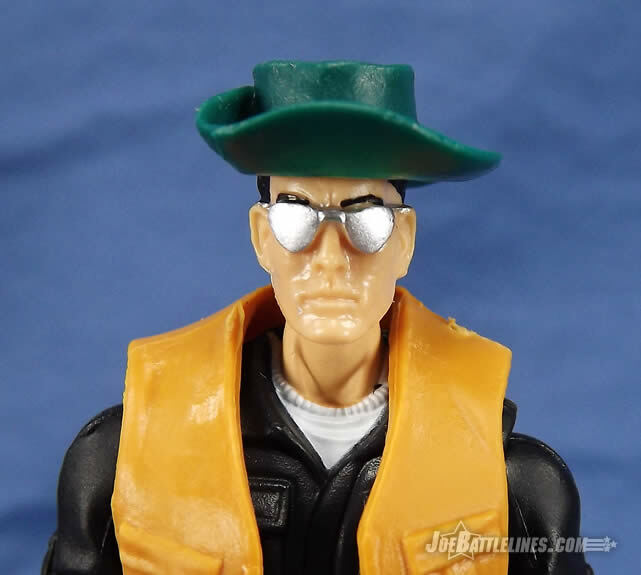 IF I put the hat so that it’s positioning exactly like the vintage figure, I’m left with an upturned forward brim that is evocative of Gomer Pyle’s ball cap. (For the millennials that are reading this, this is a comedy series from before your time.) I’ve thought about using the hot water trick to reshape it but I’ve been warned that the plastic is crazy flimsy on this and that the hat will actually end looking worse. As such, I’ve not yet found a good solution. Chris is right—the hat does fall off at anything more than a casual glance but I’m getting used to that with Club builds. Remember, form over function seems to be their primary goal. 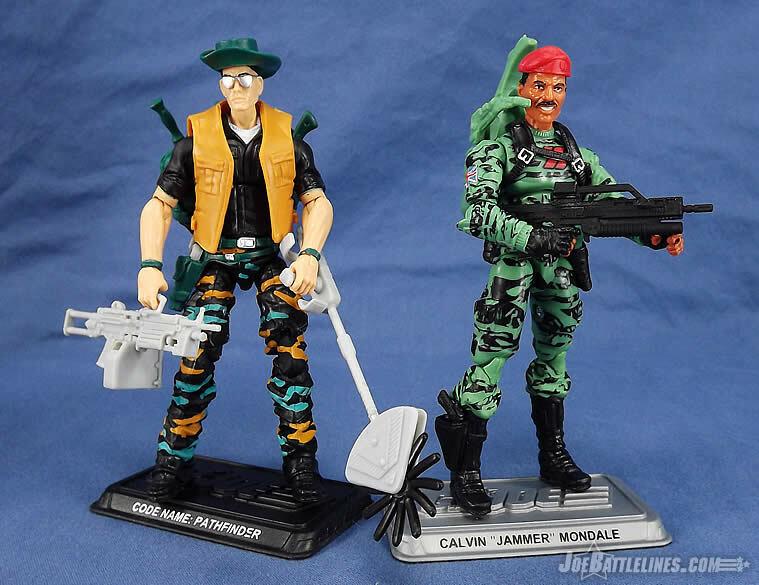 I wish they would have used the tooling money that they used to rerecreate the weed eater for a new head. I would have been fine with Pathfinder coming with the S.A.W. and the machete, but I don't think he needed anything more than that. This figure had so much potential when he was announced but ultimately the execution has been very poor all the way around. 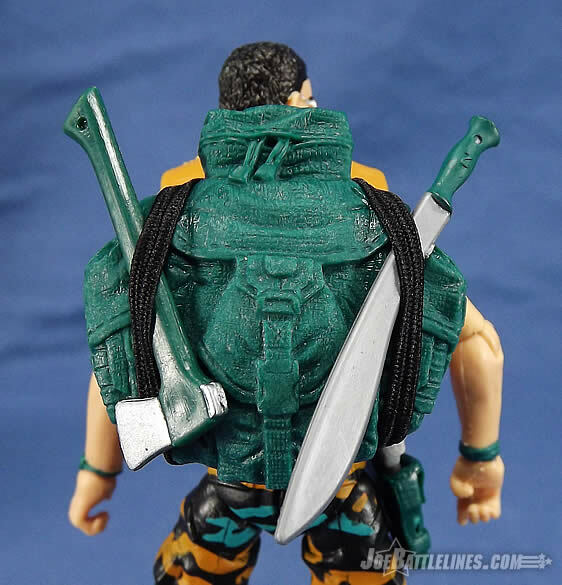 Finally the PoC Jungle Duke backpack is nice for the carry straps to stow all his junk. My only concern is that the figure’s hands aren’t really designed with this gear in mind. Both the S.A.W. and the weed whacker have thick handles that will, over time, warp the figure’s hands significantly. 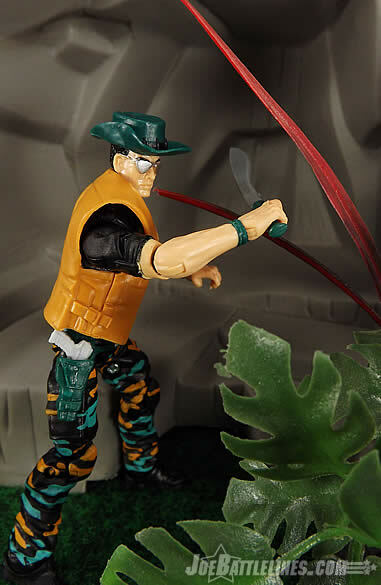 As is stands, I can only get the weed whacker to work in his left hand as the right hand just splays too much when I try to place it around the vintage-scaled handle. 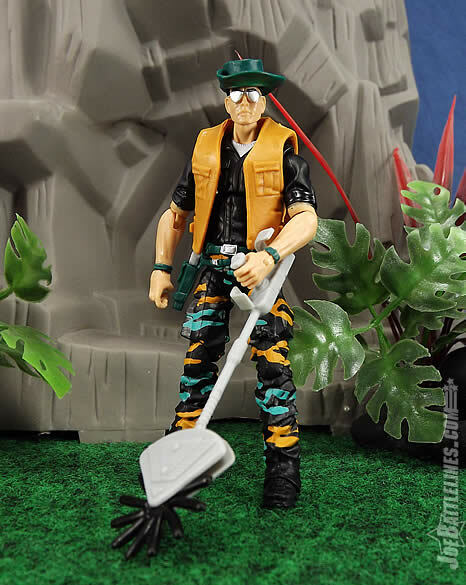 It’s pretty obvious with his gear component, when Pathfinder isn’t on a mission he’s a landscaper! Look at that foliage-killing kit! I assume since he carries no fuel or power backpack for the trimmer, once it runs dry (if it even runs in the first place) he can hack with his machete, and once that breaks he can chop with his hatchet… and… and… You know what? I got nuthin’ here. 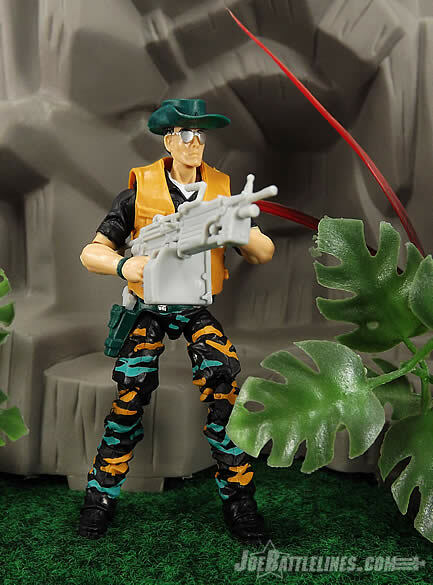 I’m trying to justify his gear, but all I can think of is “civilian gardener” not “SpecWar operator”. 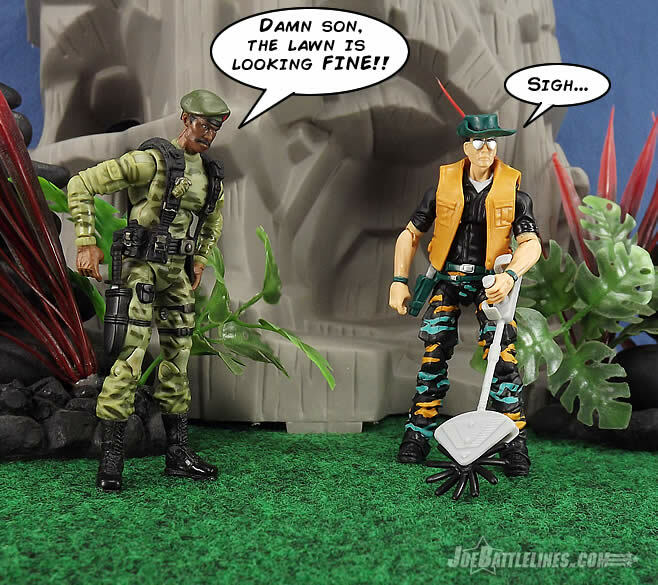 You know—I always joked that the vintage figure was more of a groundskeeper with the weed whacker. 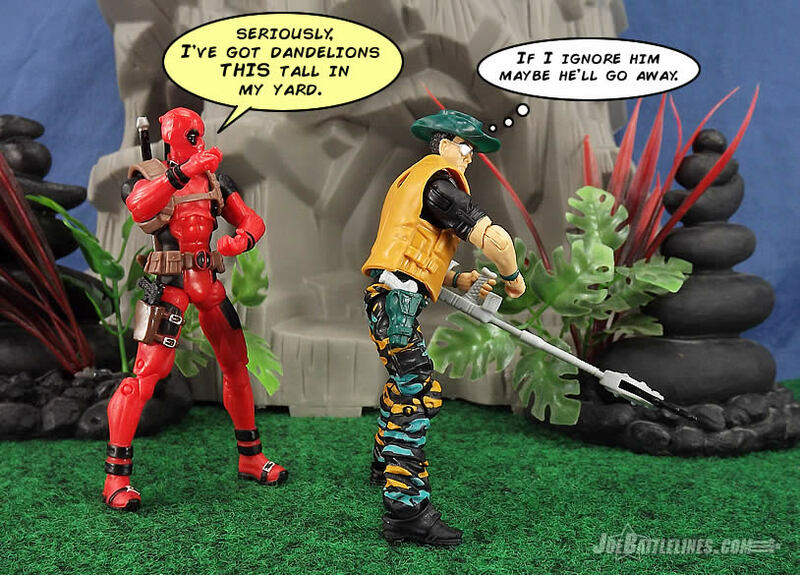 At least the machete and the hatchet make more sense for someone of his specialty. They’re silent! They don’t involve a piece of yard management equipment that can clearly be heard throughout the subdivision when used. However, this isn’t a fault of the Club at all—it’s an odd 90’s concept that now just cracks me up. 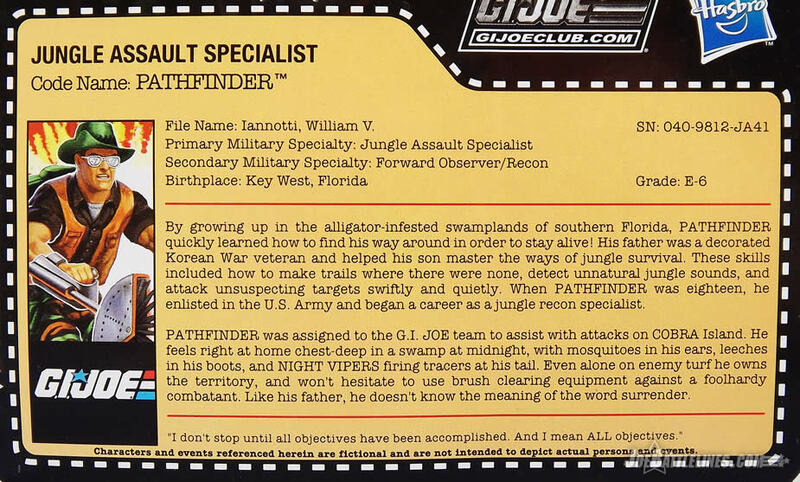 Pathfinder was one of those figures that could have reached perfection had the Club not fumbled it by going cheap. Even the hat and vest could have worked had the portrait been realistically sized, but the Club chose to concentrate on accessories over aesthetics. I think most fans won’t have a problem with the pin head, as it was a staple of G.I. Joe for many years and many have gotten used to it. (And to be fair his colors are great.) But to more discerning folks he’s a disappointment because the full of his potential was wasted. 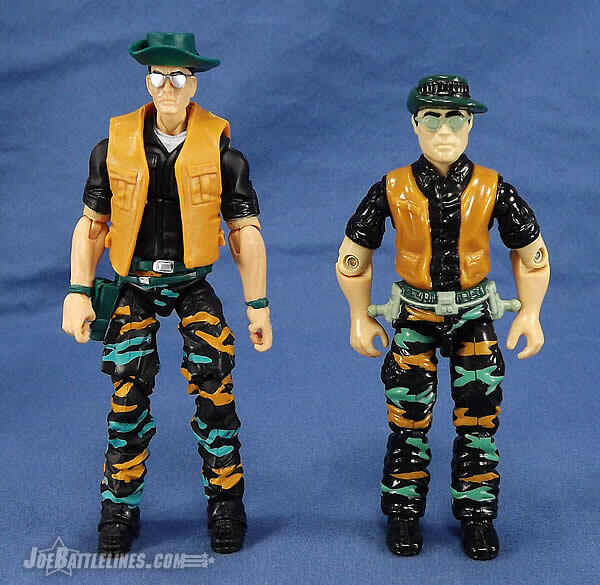 All we got was the same exact custom figure dozens of other fans had done before, with no improvement except the Club’s version has more durable paint. Sorry, but for me that does not reflect or justify an expensive high-end figure. I expected something better. You know guys, it's like somebody decided “Ok, this is close enough so we're going to call it good” - which would be fine if the club was only charging $6.00 a figure. But when we’re paying $30.00+ for a figure it needs to be perfect. This wasn’t perfect. Is Pathfinder worth owning at the end of the day? Like with so many other characters, it’s going to come down to how you feel about the original design. 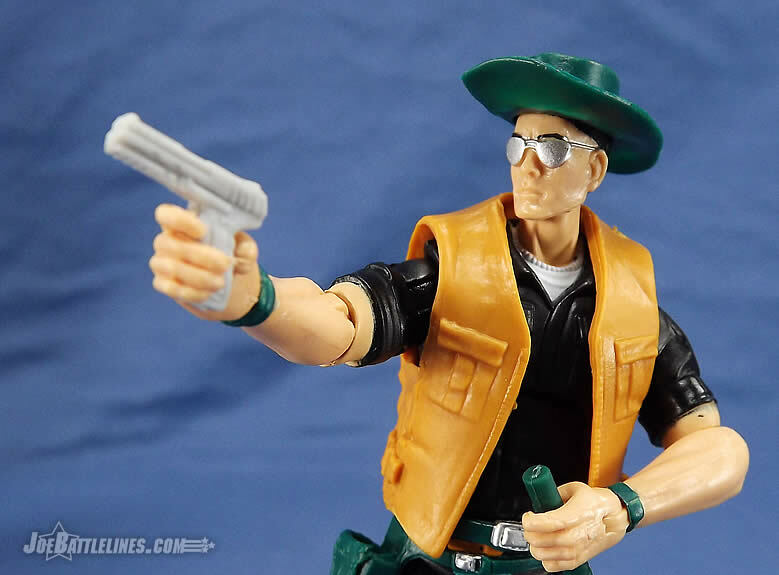 If you were a fan of the character from his limited DiC-era appearances then, aside from some odd parts choices and a potentially warped hat, he’s actually a decent figure. He’s not one of the Club’s best builds but he’s far from their worst. 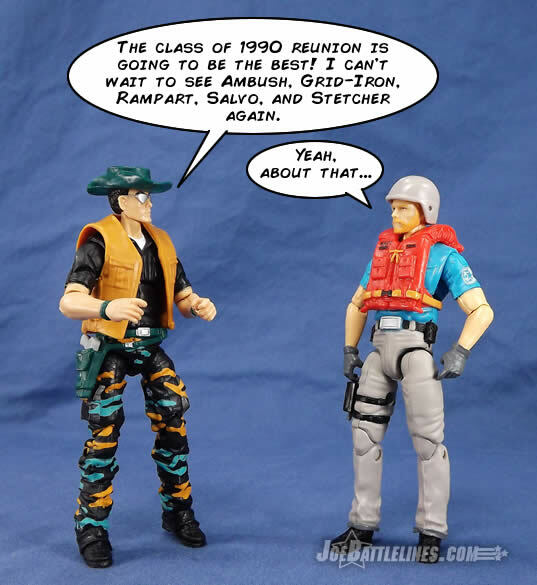 Longtime fans are probably going to be able to overlook his wee noggin’ and just enjoy him for what he is—a generation 3 update to a 1990 character. As I’ve said before, he’s far from the best Club-produced figure but he’s far from the worst. 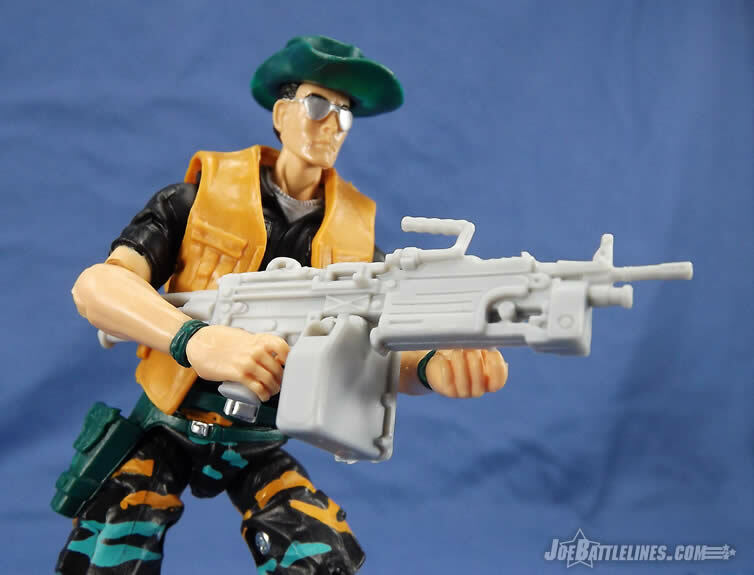 (I’m looking at you FSS Desert Grunt!) (Or Grand Slam!) Of course, that’s just this Joe fan’s opinion. The Bottom Line: Visually Pathfinder is an extremely faithful update of a vintage design that has some design issues. He’s a good figure but not as great as he could have been.